If you've been sceptical of the merits of a chorus pedal, this could change your mind. Available in a limited-worldwide edition of 900, the Blue Hippo Analog Chorus MkII adds a toggle switch to the original version to offer vibrato as an alternative to its standard chorus mode. 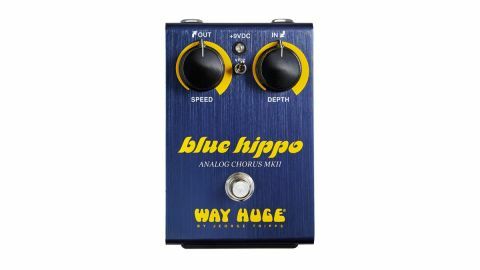 Speed and Depth knobs dial in the sound, which, in chorus mode, offers a similar rich warmth to a vintage Boss CE-2 - we preferred the Blue Hippo in an A/B test on certain settings, which is saying something! In vibrato mode, the pitch modulation is lush with a range of useful tones, as the depth knob's maximum warble remains musical rather than nausea-inducing. With inspired juxtaposition of the two knobs, there's a lot of subtle shadinghere in both modes, delivering not just classic chorus and vibrato, but blurring boundaries for sounds reminiscentof milder phasing, Uni-Vibe or rotary speaker. This is a creative hands-on pedal that beckons you to dial in your very own modulation textures, from the obvious to subliminal, otherworldly ear candy.